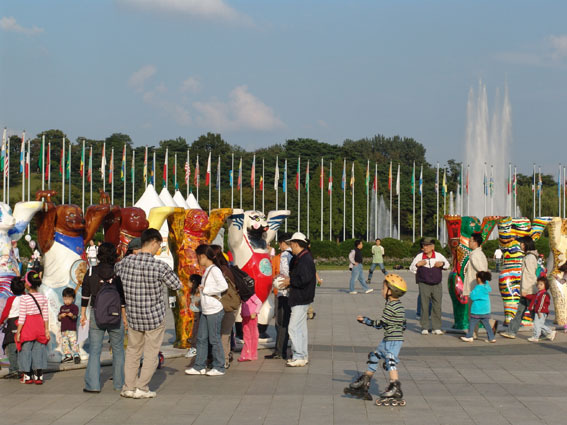 On 8th October, the circle of United Buddy Bears was opened in Seoul (Korea). Promoting tolerance and international understanding, the bears stood together "hand in hand" in the divided country. The Mayor of Berlin, Klaus Wowereit, sent a video message from the once divided city of Berlin to the guests at the opening ceremony: "15 years ago, the people of Germany were able to experience the joy of the peaceful reunification of our country. Today, we would wholeheartedly like to wish the people of Korea that they will also overcome the division in the not too distant future." 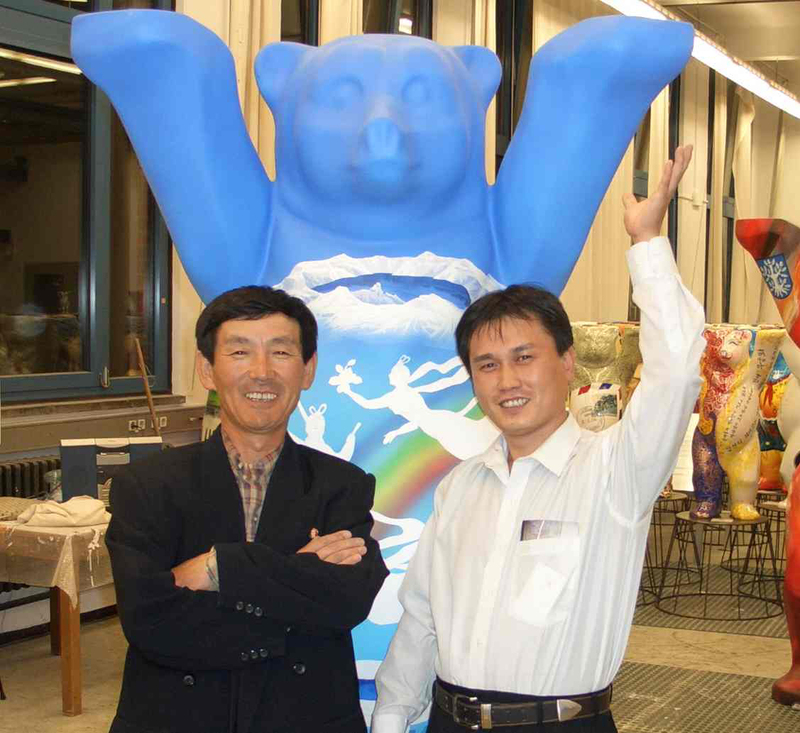 Following long negotiations with the North Korean embassy in Berlin, the Buddy Bär Berlin GmbH was able to invite two renowned North Korean artists (see above) - with the kind support of Lufthansa - to Berlin. 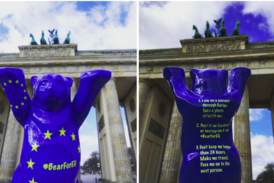 They designed a Buddy Bear for their native country in Berlin. This bear was flown to the exhibition in Seoul afterwards. Celebrated with a special event, the gap in the circle of United Buddy Bears in Seoul was closed with the North Korean bear. 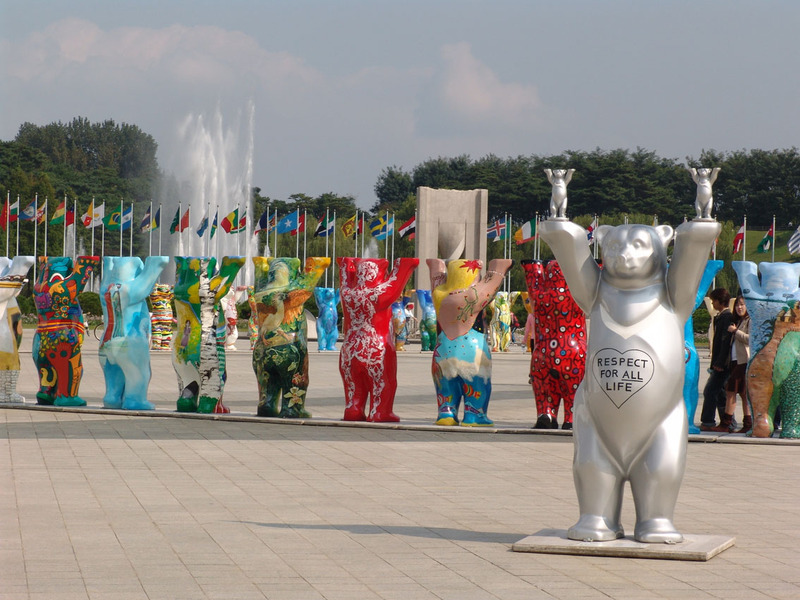 The joint presentation of the South- and North Korean bears is an artistic expression of the desire for a peaceful coexistence of the two nations. South- and North Korea standing together hand in hand in complete harmony. The bear sculpture has a particularly strong symbolism in this context: It represents the first mother in the Korean myth of the Creation which says that a heavenly creature came to earth in 2333 B.C. This creature promised to a bear and a tiger to transform either of them into a human being if he was able to hold out in a cave for 100 days - only living off garlic and mugwort - into a human being. The bear passed the test and was transformed into a beautiful woman as the reward. The heavenly creature fell in love with this woman and together they fathered the founder of Korea. 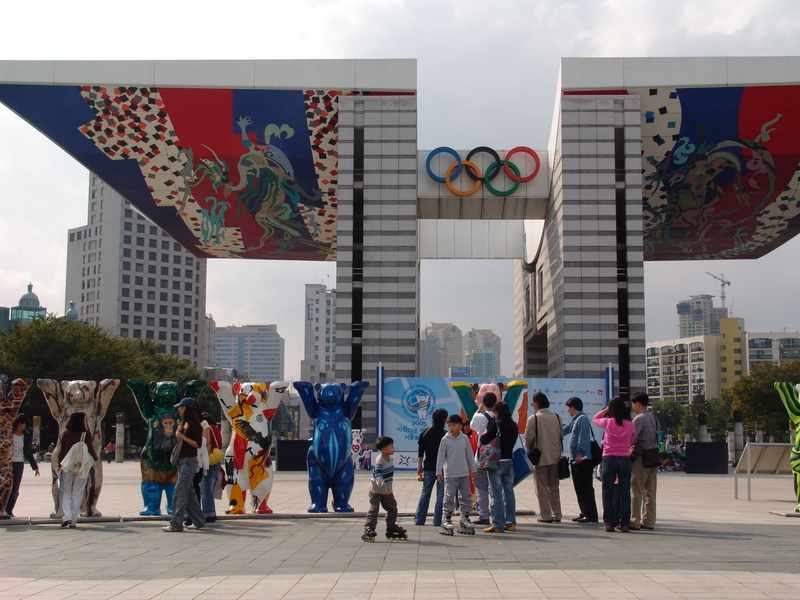 It is a conscious decision that the 125 "United Buddy Bears" promoted tolerance and peaceful coexistence in the Olympic Park on Peace Square in Seoul until 9th November (anniversary of the opening of the Berlin Wall).